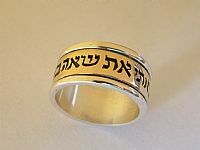 Amulets and Jewelry for health, protection, success and many more, based on the world of the Kabbalah. 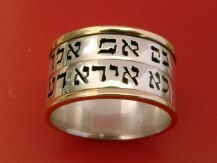 Unique rings including Amulet Rings and Rabbi Blessed Rings. GOLD PRICES are subject to change. 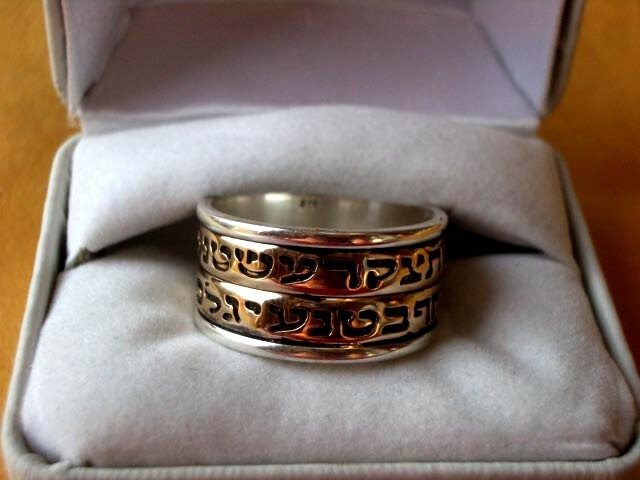 Double Silver middle ring and yellow 14 Kt gold band edges ring. using a secret kabalistic calculation. 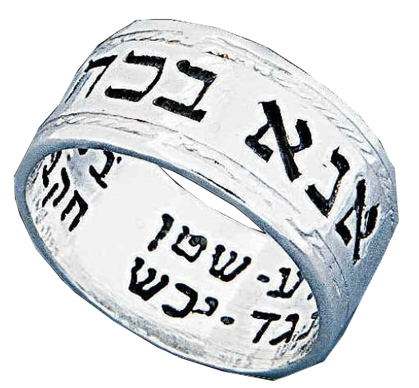 Kabbalistic Saying Number Word/Saying Wedding Saying Number Saying:Here are some sample inscriptions. K2 72 Names for: Choose Any 12 W2 "Ze Dodi Veze Re'ei" This is my beloved and this is my friend. 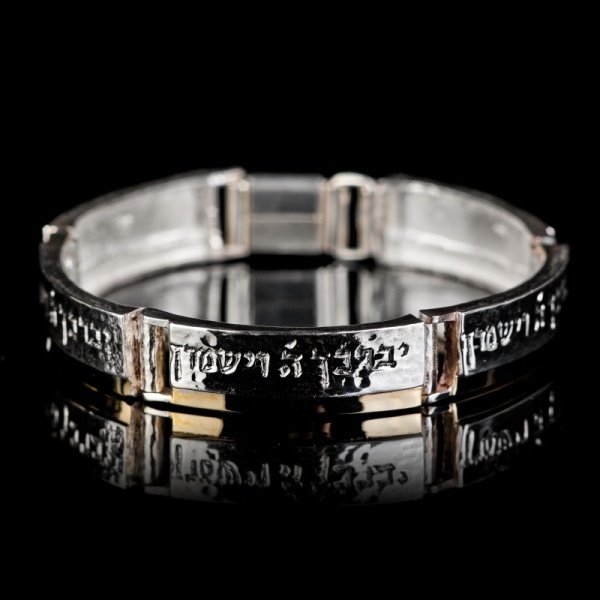 K3 72 Name: Love, Happiness, Freedom, Soul Mates, Prosperity, Protection W3 "Ha'ahava Hi Mekor Hachaim" The love is the source of life. 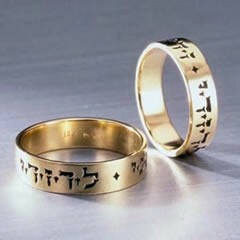 K4 El Shaddai ARGAMAN Maccabbi Yismereni * W4 "Matzati Et She'ahava Nafshi" I found him, whom my soul loves. K6 Shma Israel, Adonoi Elohenu, Adonoi Echad W6 "Ahavat Olam Ahavtich" I have loved you with an ever lasting love. K7 Ana Bekoach the complete 42 Letters of G-d W7 "Simeni Kahotam Al Libcha" Put me Like a seal over your heart. K8 I AM That I AM (Hebrew or English) W8 "Tihye Nafshi Kshura Benafshech" Let our souls and spirits interwine. K9 Be Still & Know That I AM (Hebrew or Eng) W9 "Betseti Likratcha Likrati Metsaticha" When I go forth to find you - I find you seeking me. * G-d Almighty One", followed by ARGAMAN, an acronym for the five archangels: Uriel, Rafael, Gabriel, Michael and Nuriel. and Maccabbi is the acronym for "Mee Kamocha B?eileem Adonai" or "Who else is like you in the eyes of God? ", "Will guard me". *** G-d Almighty One", Yismereni, meaning: " Will guard me". Revised: 30 Nov 2014 22:31:55 -0500 .